Below is one combined picture and picture of pastors training's of LISU people group in Kachin State. Two pictures from Luk Pe village, Mindat area. 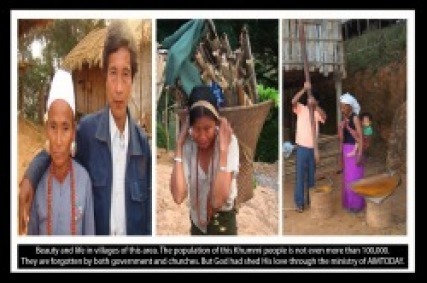 Information on the MUIN people group in Mindat area. The MUIN people live in Mindat area, southern chin state. The population is estimated to be about 100,000 (one hundred thous the majority of this people are either buddhist or animists (natural worshipers). They rely on natural resources for their living. The following pictures were taken during our mission trip in March, 2009. There were 30 people who made a public profession of faith in Christ by receiving baptism. Half of the people who took baptism were formerly an ANIMISTS, natural worshipers. Andrew Thang Ling Om is our key leader and AIMTODAY has been working in this area since 2007. NOT BY TAKING INITIATIVES...BUT BY RESPONDING TO THE CALL"
It was late in 2002, November 10th that I arrived this State knowing not where the Lord was going to lead me. But the call was clear and in the year 2003 the Lord led me to a small village occupied by just 7 families. Consequently, the Gospel of a living God and a future hope was brought to these people. I lived with the people in the village along side my friends, Victor Zika and Manahung, who were helping me in the work. In 2004, another 3 families (so called Christian) joined our village from other village. The family numbers in the village became ten. In 2005, the Lord added to us another 7 families from other village. Hence, we have now 17 families in the village. The work in this village started in 2003 "not by taking initiatives - but by responding to the call." And Jesus Christ, whom we believed, has been purely preached in the village since Philip has entered the village in 2003. Plenty of tears were shed in this village and tears have been transformed into joy. Though Philip now lives and started the ministry Yangon, Timothy Yar Htun Hla, husband of Phoebe, had been ordained as pastor in April 2009 and he is now pastoring this church. Philip remains serving this people as their encourager and teacher. Please remember Timothy and Phoebe in your prayer. Information on the KHUMI people group in Paletwa area, Southern Chin state. This people group known as KHUMI live in paletwa area, southern chin state. The population is estimated to be about less or more than 100,000. They rely on natural resources for their living. AIMTODAY has been led to not only reach but to plant His churches in 7 villages. Picture at left are our key leaders with gh which we have been reaching and serving the KHUMI people group since 2007. Spiritual hungers have been given to them by God and AIMTODAY continue carrying out, in obedience to Christ, it's commitment by visiting and conducting conference for church leaders and lay people. If God open more doors this year, then we will continue to step out by faith so that souls be saved and lives be transformed into the likeness of Christ before our Lord returns. There is no greater investment than to invest who we are and what we have in the lives of people who are spiritually hunger for God and His words.